Sweet Shellie was found wandering the streets of Philadelphia this past summer. Shellie is an easy going adult German Shepherd who loves to meet new people. With the help of Charwill German Shepherd Rescue, Sedona Shepherd was able to save Shellie from being euthanized when the shelter became over crowded. Once Shellie settled into our program it was obvious that she had medical issues that needed to be attended to. The biggest concern is the chronic ear infections in both ears. Any owner of a dog that has dealt with chronic ear infections knows how difficult this issue can be to get under control, especially if the ear infections have been neglected for some time. With the help of Fanwood Vet and our volunteers, we put Shellie through a number of medications and daily flushing and cleaning of her ears with the hope of cleaning out the ear without the need for surgery. While we have been able to stabilize the infections, Shellie continues to be very uncomfortable and the effectiveness of her treatments have plateaued. After consulting specialists at Crown Vet Hospital, it was agreed that the best course of action is for a total ear ablation surgery on one and possibly both ear canals. The surgery removes the ear canals and cleans out all the infection as well as the possibility of continued infection. Without this surgery, Shellie’s ear infections will not get better and she will remain constantly in a state of discomfort. The cost of the surgery is approximately $3,500 and the recovery time is about two – three weeks before she will be able to be adopted. We have had success with this type of surgery in the past and we know that once it is completed that Shellie will truly be able to enjoy her life and look forward to finding her forever home. Sedona Shepherd Sanctuary is an organization located in New Jersey, USA that helps rescue and find homes for adult and senior German Shepherd and shepherd mix dogs. Founded in 2014, we have directly saved over 150 dogs with an average age of over 7 years. UPDATE : DEC 6, 2018 - Shellie is recovering from her surgery. The recovery process will take a while and she is in some discomfort and pain. For now they will continue to have to drain her ears. We are also waiting on the results of bacteria culture taken during the surgery to make sure we know exactly which anti-biotics to be using and what are the best medications to help with the remaining ear, which we are hopeful can be saved. Shellie is now home with her foster home recovering from the surgery. The vet removed all of her tubes, she still has a pain patch on her that wil be removed in the next couple of days. Shellie is feeling a lot better and getting spunky and ready for some exercise. She really loves being with her foster mom. Shellie had her sutures removed on 12/19. Additionally the vet was able to determine all three infections that are still in her good ear and is special ordering medication for the last tough to kill bacteria. She is very happy to get rid of the cone. Shellie is a sweet adult German Shepherd rescued from an over crowded kill shelter. She is need of surgery on both ears to fix chronic ear infections that have her in constant discomfort and pain. Free copy of Lost Souls:Found! 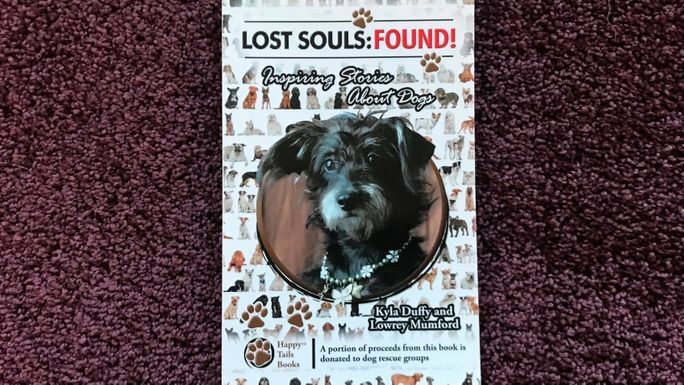 Inspiring Stories About Dogs by Kyla Duffy and Lowrey Mumford Tells inspirational stories about rescue dogs, including the story about Sedona, the soul of our rescue. * $300 in offline donations included in total.